Pet accommodation: 25.00/night per pet. Pet limit: 1 pets per room 80 lbs or less. 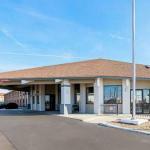 Just a short drive from popular tourist attractions such as Mad River Mountain ski area, this hotel in Marysville, Ohio offers convenient amenities for a comfortable stay. Comfort Inn Marysville is just minutes from the Columbus Zoo and Aquarium, the Piatt Castles and the natural Ohio Caverns. A variety of corporations, such as the Honda Automobile Plant, are nearby. Complimentary amenities at the Marysville Comfort Inn include a daily full breakfast, high-speed internet access and local calls. Guests can swim in the indoor pool and spa or relax on the sundeck..
We plan to add more related stuff like: pet friendly hotels in Marysville, Ohio dog friendly hotels in Marysville, dog parks in Marysville, pet stores in Marysville, OH, and pet spas in Marysville. Keep checking for more!